Found in the newspaper archives at the Williamstown (PA) Historical Society, this fascinating letter details on local soldier’s experience in a pivotal battle of the Second World War. Corporal Charles Barry found himself among the first American soldiers to land in Italy near a small seaside city named Salerno in September 1943. The former Williamstown High School gym teacher turned medic was 30 years of age when he swam ashore as part of Operation Avalanche on September 9, 1943. His duty during the Allied landings would be patching up injured American soldiers as they pushed inland from the coast. He recorded his actions during those desperate first hours and days in Italy in a letter to his sister in Williamstown, subsequently published in the Williamstown Times in December 1943. A true picture of what war really is can be taken from the following contained in a letter from Cpl. Charles Barry to his sister, Mrs. Ted Houtz, on West Street. “Yes, I can tell some things now. Incidentally I was the first Corporal of any American troops to land and one of the first Medical Corpsmen. You were right about my job, going out under fire to fix wounded. We were up on the front, in fact we were there on the front for 13 days. Speaking of 13, how’s this[:] I was on the 13th train to leave Camp Edwards, the 13th coach, left from Pier 13 at Oran and spent 13 days in Italy, and they say 13 is unlucky! All you read in the papers was true only you can’t describe the half of it. Just as the movies portray battle scenes is as close as I can give you of the description. I’ve seen a bit of everything and patched up soldiers, civilians, and even German wounded. One German boy of 21 was hit at 5 different places, holes as big as a half dollar and lay all the first day and night. I found him the next day and fixed him up. I believe he pulled through too. Those sulfa powders and pills are wonderful and save many lives. 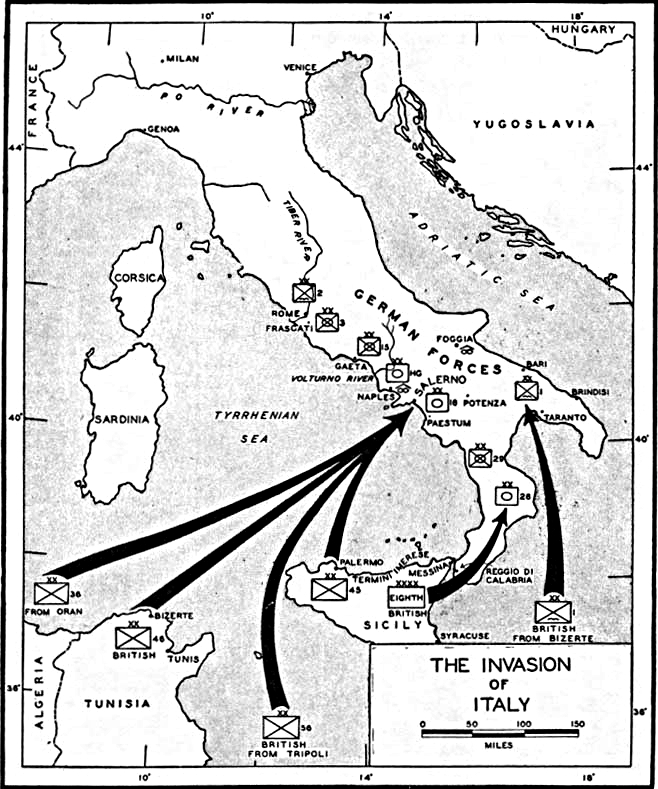 Italy’s surrender, we heard about it 6 hours before we were to leave the boat for the small assault boats, didn’t help our landing any. They didn’t shell or bomb the beach area for us like they always do. We even had orders not to shoot until fired upon because of civilians and Italy’s surrender. Well, that is what made it Hell plus the fact that the Germans knew where and when we were landing and were lying waiting on us with 2 Panzer divisions. The Panzers are their crack tank outfits – 80 tanks to a division plus armored vehicles, etc., machine guns and everything else. I hit shore about 3:45 a.m., stepped over the rolls of barbed wire and went through about 75 more yards when all hell broke loose. A number of times I was pinned to the ground while machine gun bullets whistled overhead. I could only see the tracers… and boy they came close. One rifle man kept picking twigs off a bush over my head about 8 inches; he couldn’t see me though as it was dark. It was when I moved from there I fell over another strand of wire. Tanks we could hear and when it got light see only a few yards ahead of us. I always said this outfit was the roughest, toughest in the Army. Well they were. One captured German said: ‘What were those troops, they fight like demons, not men. They’re either damn good fighters or crazy.’ Well, they were fighting… to live. Another captured officer said he saw it but couldn’t believe it for just riflemen to attack and drive back tanks, they just swarmed all among them and I saw plenty of them knocked out and burnt. The Chaplain said most of the dead he buried (German) were shot between the eyes – good shooting. I saw Germans blown to mince meat and burnt in tanks, and boy the worst thing on earth for smell is a dead German. I smelled them after they lay for two days and more, shew! I’ve also seen quite a few air raids, been in them and saw bombs drop, etc. Saw quite a few Jerry planes come down in flames just as the movies portray – they (the planes) scream get louder all the time. Then it hits, then quiet. I’ll try to write tomorrow again. Charles O. Barry was born on April 29, 1914 in Tower City, Pennsylvania. His parents, Charles and Elizabeth Barry, raised young Charlie in a middle class household supported by his father’s work as a fire boss in the mines. The family was rocked in 1919 when the elder Charles died in a cave-in at the Susquehanna Colliery in Williamstown. Charlie was six at the time. His mother remarried and kept the family together through the 1920s and 1930s. Eventually, the young Charles attended West Chester Teachers College and found his way back to Williamstown to teach physical education. He joined the war effort in June 1942 and shortly thereafter married Lucy Thomas Millington of Port Carbon in January 1943. Charles Barry survived the war, returned to Williamstown, and passed away in 1976. He held the job of Postmaster in Williamstown from 1947 until his death.